I was catching up on some work tonight. I had a Visual Studio 2005 application running on an XP machine, connected via TCP/IP to a Java server application running on a Fedora Core 8 machine. 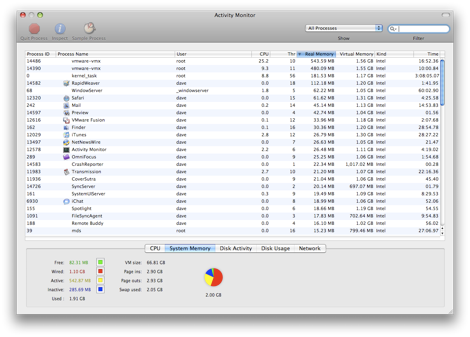 During compilation, and commits to source control, I was going through my news feeds in NetNewsWire on my MacBook. No big deal, right? Well, the interesting thing is that only the MacBook was a real machine: the XP and Fedora machines were actually virtual, and running on the MacBook courtesy of VMWare Fusion. It hit me just how much computing power we have at our disposal these days: a 15-month old consumer-grade laptop running 2 virtual machines plus its own applications, all simultaneously and without any perceptible slowdown: this is not even a MacBook Pro! In the top-left we have space number 1, where: I have started to write this post in RapidWeaver; iTunes is running (that's Californication from Red Hot Chili Peppers at the front, if you were wondering); Transmission is seeding the Fedora Core 8 DVD ISO; OmniFocus, iChat, Terminal, Mail and Safari are all doing their thing; and Activity Monitor is letting me know how this is all going. It's not shown, (eggs, chickens and what not) but I had Pixelmator going as well, long enough to blur a couple parts of the screenshot to protect the innocent. 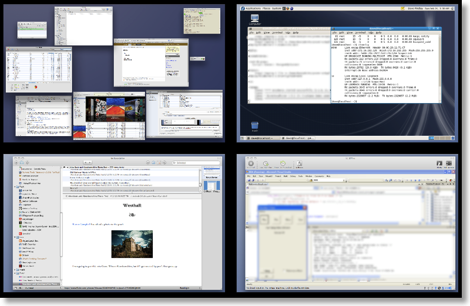 In the top-right, the Fedora 8 VMWare Fusion virtual machine is running a Java server application and its database backend. In the bottom-left, NetNewsWire is keeping me up-to-date. Finally, in the bottom-right, the XP VMWare Fusion virtual machine is running Visual Studio 2005 debugging an MFC application; by the way, I don't know MFC. The big hitters, unsurprisingly, are the two virtual machines, weighing in at around 500MB each. They were both configured with 512MB of RAM, so that makes sense. Next we have the kernel, close followed by RapidWeaver (the application that I use to write this). From there you're down in the weeds of measly 60MB chunks of RAM here and 40MB chunks of RAM there. From the stats at the bottom, you can see that there's 369MB (sum of free and inactive) of RAM free (see this Apple article for an explanation of the different categories of memory). And just think, if you buy a MacBook now you can fit 4GB in it and the integrated graphics are faster than mine. How many VMs can you run?